An international team of scientists have discovered that Atlantic haddock can suffer extreme and often deadly deformities during the development stages if their eggs are exposed to even small amounts of dispersed crude oil. The results show that major fisheries, including those of cod, pollock and haddock, across the world can be severely affected by oil spills in high latitudes. The study conducted by researchers from NOAA Fisheries' Northwest Fisheries Science Center, located in Seattle, and from Norway, shows that the growth of important organs of embryonic fish is disrupted by crude oil. The results of the study were published in the August 10 issue of Scientific Reports. The VISTA Foundation, Norway's Institute of Marine Research and the Research Council of Norway have financially supported the research to determine the ill-effects of oil spills at the center of Atlantic haddock's range, in the remote regions of northern Norway. The research team will gather data that will enlighten environmental risk assessments of the oil drills proposed in the northern oceans. Research conducted in the past shows that the growth of the fish’s heart, as well as its chances of survival later in its life, were affected by the polycyclic aromatic hydrocarbons (PAHs) present in crude oil. The recent research has revealed that severe craniofacial deformities of embryonic haddock were also caused by the oil. Study of other species of the Atlantic cod shows that the deformity can be a common reaction of all fish belonging to the cod family, including Pollock and Pacific cod. The severity of the deformity depended on the how early the embryo was exposed to crude oil. The dispersed droplets of crude oil act like a kind of toxic time-release capsule that binds to the eggshells and leads to these extreme abnormalities. That creates a unique and newly recognized pathway for crude oil to interfere in the reproduction and survival of these fish. Incardona stated that the eggshells of Haddock may have some protein that makes them particularly “sticky” to oil and oil compounds, during their early development for a period of 10 to 12 days. Haddock belong to a huge family of fish, known as the gadiformes, which include other fish such as pollock and Arctic cod that are both economically and ecological significant. These fish were not directly studied during the research. Researchers are yet to find out if these species are also vulnerable to deformities due to oil spills. 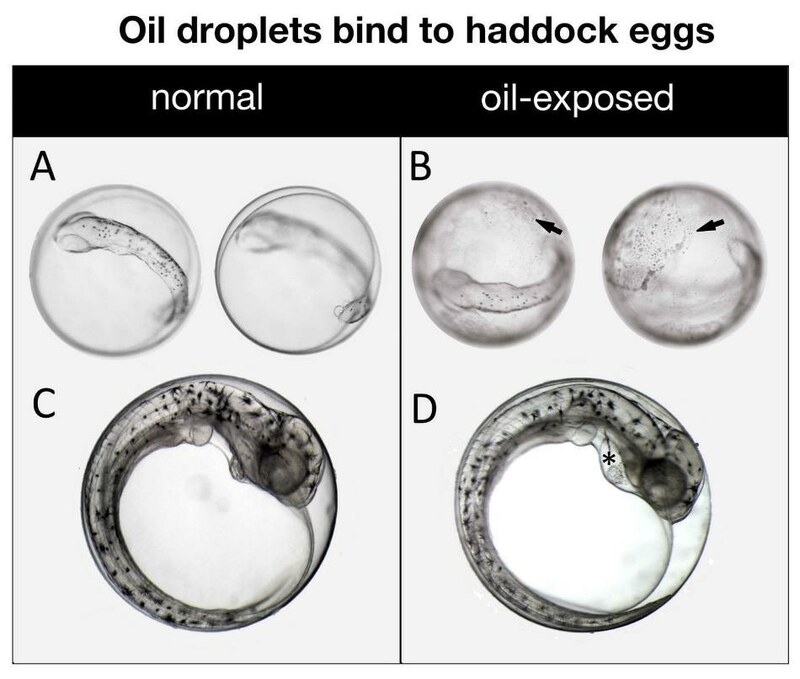 Though oil doesn't attach to other species’ eggs like in the case of haddock, deformities can be caused due to the byproducts of oil. The physiological channels that send signals to the head and heart muscles of the fish are affected by oil compounds, damaging their operation and disrupting their early development. If the muscles are not operating correctly, then everything connected to them including bones do not develop the way they normally would. You end up with the muscles pulling differently and the bones forming in strange ways that lead to these extraordinary deformities. Due to the deformities, the survival of young fish, which have to attain rapid growth and development to fend off their predators and further the population, are affected. Oil spills in a densely populated haddock area where numerous eggs are present at that particular time can result in lasting effects on the entire haddock population and also affect the species that prey on the fish and their eggs.